A party can be a lot of fun, except when it’s time to clean up. This is when we are grounded back to reality. All the fun also means a lot of mess. Don’t know where to start, read on for a step by step guide to cleaning up after a party. Hold on to the joys you felt during the party. Keep on enjoying this feeling and do not fret about the task ahead. Remember that you do not have to do everything all at once. 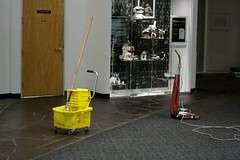 There are priority clean-ups that you need to do immediately, and then there are those that can wait the next day. Does your home look like a hurricane ran through it? Or, is it more like a minor storm? Whatever the case, make a quick assessment. This allows you to zone in on the problem areas–those that you need to handle right away–as well as those that can wait till you got some rest. Step 3: Gather up all the drinking paraphernalia first. This pertains to cups, glasses, mugs and bottles. When you gather them, make sure to check the surrounding areas for any spills. Attend to these spills right away. Bring the used drinking paraphernalia back into the kitchen. Empty the glasses that still have some contents in them. Then, place these in the dishwasher. Step 4: Do the same for plates, saucer, and other used dining utensils. Clear each plate of leftovers and then place them in the dishwasher. Step 5: Segregate your garbage. Keep paper cups and paper plates in the recyclable bag. Plastics and other non-biodegradable trash should be kept in another container and left for the garbage men to pick up. Biodegradable garbage can be used as compost or set aside for the recycling center. Even when cleaning up after a big party, this should be an easy task since you’re most likely just clearing leftover food and drinking and eating paraphernalia. Step 6: Leave the rest of the task for the next day, and get some much deserved rest. You can wipe off dust, vacuum, and do the dishes when you get up in the morning. Remember to make the kitchen your last cleaning stop as this might be the worst hit and hardest to clean. A party is still a party, even after everyone’s left and you’re face with a lot of mess. Relax, and get your priorities organized. Even a clean-up can be a lot of fun, with the right attitude. Cleaning Your Refrigerator – Cleaning things at home to create more space. Organizing Closet – Organizing and cleaning things up. Setting Table – Party preparation and other party-related stuff. Organize Bake Sale – All about cooking and other party-related things. Making Cleaning Fun – On how to make cleaning activity more fun. Imperfect Home – Home cleaning and other things to make home beautiful. Home Decorating Ideas – On making your home beautiful and attractive. It would be extremely helpful if you have your friends to stay behind and help you clean up after the party. You can delegate tasks to them to speed up the cleanup. Make sure to have someone assigned to get everyone coffee or towels or just a quick massage to lighten up the mood. It will also help if you have music playing in the background so that you won’t notice the time and have great bonding moment with your friends. You can take pictures of you and your friends to cherish even after the party is over. I love to host parties but cleaning up after is one of the things that I don’t like doing. But then again I have to do it right? So what I do is I try to make it as fun as possible. I listen to music and dance or talk to a friend over the phone and rave about the party we just had. I also try not to look at the task as daunting and start with simple tasks first. I also start planning for another party that I can host again and imagine how much fun it would be the next time around. So smile while cleaning up!! Having a party is a messy affair. Planning alone and cleaning up after will take time and effort to organize and clean up before and after.After the party you organized has ended,it is your responsibility to clean up since your the one who hosted it. It is just like simple house cleaning but on a wider scale. Pick up all the scattered plastics,papers and glass first before any major wiping of the floor, tables and chairs begin.You must also not forget to use disinfectants to remove any germs just to be safe. Just be responsible in cleaning up since the people you invited will not only respect you for the good party you organized, but also see that you clean up well and is a responsible person. People who hosted the party should take full responsibility in cleaning up the mess. I know it’s a huge mess but what the heck? You had a party so you clean it. Take full responsibility. Don’t just sit around, work now so you’ll soon be able to finish it. It may be a little difficult but it’s worth it. You had a lot of fun in your party. While cleaning up the mess, why not recall the good things that happened in your party while you’re at it? I think that it’ll be a great way to give you more energy to clean. If you don’t want to clean up the mess and you’re just so tired or maybe you’re just a lazy person, why don’t you just hire someone to clean it up for you. The only problem is… it’ll cost you. If you still have the energy to clean up the mess after the party you can do so but if you’re too tired to do it (probably too drunk or too tired) you don’t want to be dropping and breaking glasses and plates, so if you are too tired to clean it all up. you can always do it first thing in the morning. But first, don’t hit the hay until you’ve taken care of the food that are still worth keeping. It’s very important to determine if you can still store them in the fridge so that you can still have it the next day. If you’re not too groggy from partying and you still have the energy to tidy up the disarray you can then continue the clean up. Also, spray some air air deodorizer to freshen up the room and lessen the smell of alcohol and probably the smell of cigarette left by your guests. It is never easy to clean up after the party. But this should not disheartened you to a point that it eclipses the fun you just had from the party, after all, you hosted that party because you want everyone to enjoy and have fun, and including yourself, of course. Everyone dreads the after-party-clean-up. This is the most tiresome part of hosting a party. To make this tedious task easier, what I do is that during the party itself, I try to minimize the mess by picking up empty bottles, cups, glasses, plates etc discreetly before it could pile up. I roam around to check on friends. I make sure they are enjoying the party but at the same time I’m looking for empty bottles or glasses to put aside so that after the party, there would only be less mess to clean up. You don’t have to do this all the time especially while the party is still on-going. Don’t worry, you will still enjoy the party but at the same time you are cleaning up little by little.